A washer that won’t start or turn on means dirty clothes can’t get washed. When you are without a washer, that can be a big problem. 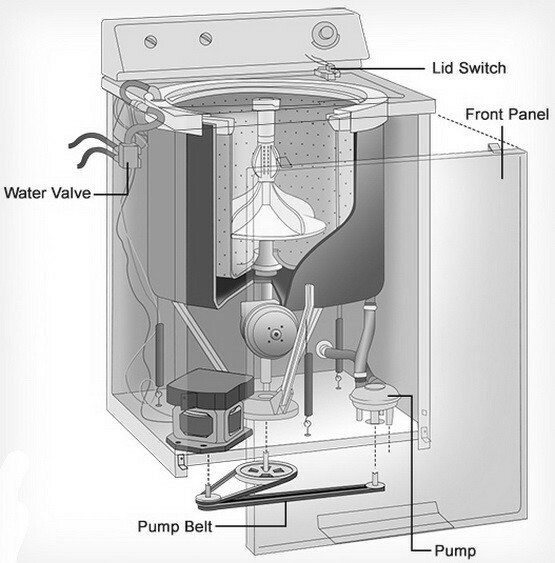 To get your washer to work properly and start, we have compiled a repair guide below to assist you to fix a washer that will not turn on, start, or run. The procedures below are for both front loaders and top loader washers. 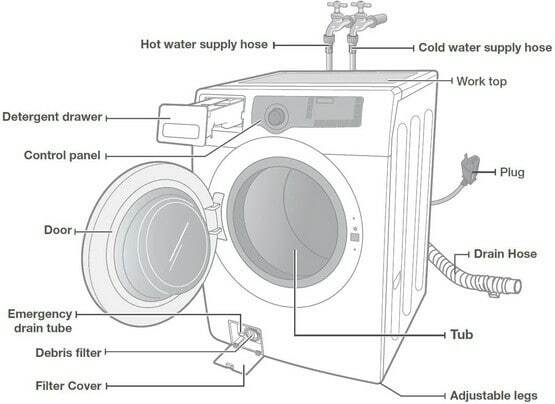 Below you will find a list of the most common washer parts and components (from the most probable to the least probable) that can malfunction and cause your washing machine to not turn on or start. Use our comprehensive list to help you troubleshoot which part may need to be removed and replaced. 1. Power breaker off, washer not plugged in. 2. Lid switch faulty, door switch faulty. 3. Start switch and or timer faulty. 5. Main control board faulty or shorted. Be sure the washer is plugged into the electrical outlet in the wall. Also be sure the breaker switch in the breaker box is turned on. If you live in an older home your box may be called a fuse box. If so, make sure the fuse is in good working condition. The door switch is a safety feature on front loading washing machines. On front loaders, the door switch must be closed and the door must be locked. If this switch malfunctions, the washer won’t start. This switch is in the door frame of the washing machine where the door shuts. If you suspect the door switch is causing your washer to not start, carefully check the strike where it engages into the door lock assembly. Be sure the lock is working properly by keeping the door shut and locked shut. You can check the door switch for continuity with a multimeter. Be sure to disconnect the power to the washer when you check for continuity. If there is no continuity, replace the door switch. A lid switch is a safety device located under the lid on top load washers. This lid switch will not let the motor operate when the the lid is open. If the lid switch is faulty, then the washing machine will not start. It may fill with water but will not spin if the switch is faulty. Some lid switches on top loaders also control the water inlet valve. 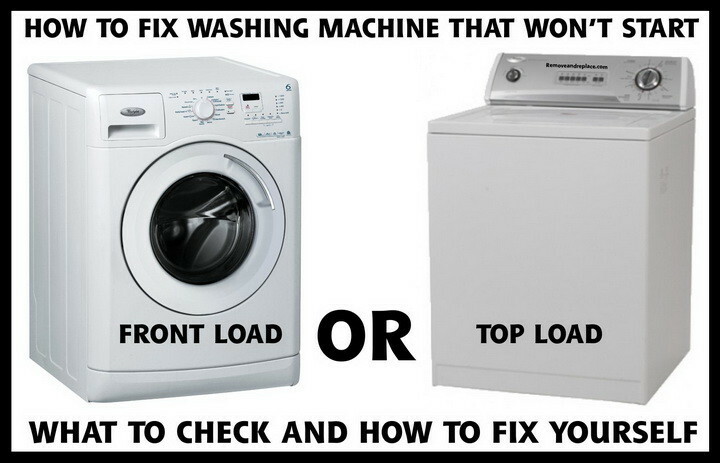 In some top load washers, if the lid switch is bad, the washer will not fill with water. The lid switch is under the lid. There is a pin or pusher attached to the lid. This pin or pusher (when lid is closed) will press the lid switch. If your washer will not start, be sure the switch is being pressed. If the lid switch is being pressed but no power is being supplied to the washers motor, then the switch is most likely bad. To test the switch, turn off power to washer and remove the wires from the lid switch. Check the switch for continuity with a multimeter. If there is no continuity, replace the lid switch. The start switch timer on top load washers is part of the timer. This starting switch is turned on by pulling out the timer knob. If after pulling the timer knob the washer will not start, you can test it for continuity with a multimeter. Remove power from the washing machine and find the timer contacts. Some top loaders have a start switch that is a momentary contact type of switch. This switch will be located on the control panel. You can also test this switch for continuity with a multimeter while pushing the button in. Remove power from the washer before testing for continuity. If there is no continuity, replace the start switch and or timer. Sometimes the timer knob wears out and cannot properly engage the timer shaft. If this is the case, then the knob is at fault. The knob cannot grip the shaft therefore is unable to turn the machine on. A worn knob will cause it to slip. Turn off power to the washer and inspect the back of the timer. Make sure the timer shaft engages the knob when it is pulled in or pushed out. If the knob is worn, replace it with a new one. Both top and front load washers use a motor that spins and agitates. (A top load washer uses a reversing motor) The motor spins in one direction to agitate and the other direction to spin. When the wash motor will not turn on it may be faulty. If the motor makes strange humming sounds then the motor may be at fault. To test the motor, remove the belts and try to start the motor. If it runs then you know something else in the washer is causing the issue. On newer direct drive washers, you will have to disconnect the pump and the coupling to the trans. If the direct drive motor turns on, then then you have a transmission issue or possibly the pump. If the direct drive motor won’t start then it should be replaced. On front load washers the motor drives the washing basket with a ribbed belt. Remove the belt and try to start the motor. If the motor runs, then be sure the basket turns and doesn’t have anything stuck or jammed between it and the outer tub basket. The control board controls every component in your washer. If the main control board does not properly control the motor, the filling valve, the drain motor, or the door lock, the washer will not start. The only way to determine if the control board is at fault is to visually inspect it. Check for burned areas or any component on the board that may look burned or damaged. If you find burned areas or components on the control board, remove and replace it. Looking for WASHING MACHINE ERROR CODES? Here are fault codes for Bosch, Frigidaire, GE, Kenmore, LG, Maytag, Samsung, and Whirlpool washers. experts over at Appliance Repair Questions for free answers to fix your broken appliance! I was using it to do laundry earlier today and finished four loads. (I washed two loads twice.) When I loaded it again for a fifth load, added detergent, and set the washer to run I encountered a problem. The washing machine currently will not start on any settings I have tried. After I set it to run, the fill light just blinks at me and the washer beeps about every 5~10 seconds with two beeps. The only thing I’ve tried is different settings to see if I can get it to run, cleaning the lid and ridge around the top thoroughly with a hot, damp washcloth, and unplugging it for a minute and replugging the machine back into the outlet. Any assistance or guidance would be extremely helpful as GE was no help at all on the phone or website. I do not have the proper tools to do the extra testing and repairs on the few websites that I have found that are similar to my issue, so if it gets into ohmmeter and wire splicing territory, I’ll have to schedule a local repairman, but I’d prefer to fix it myself if it’s a relatively easy fix. Many thanks in advance for any help you may provide. Hi! I was searching the net for assistance with our front-loading washer. Thankfully, I came across this site. Our Maytag “Maxima” Front-loading washer stopped working properly a few days ago. An error code: F1E2 appeared on the screen. The door would not unlock, as we had to several minutes for it to unlock. We restarted the cycle to notice no water came out doing the rinse cycle and the issue began once more. We called a professional technician out here to come and repair the issue. Once looking at the machine, taking it apart, and inspecting it the technician/repair-man said it would be $500. He also said it was the ‘electric control core’ in the computer not allowing the water to come through. So instead of dishing out half a grand, I decided to search for alternatives. Do you have any solutions? Can you give us the model number of your Whirlpool washing machine so we may assist you in fixing your washer? We have a whirlpool gold top loading washer model #GSX9885J. After we had a huge power surge the washer won’t turn on at all nothing.. there is power to it. It’s all digital. Is there a reset or something ? My LG WTF6700 top load washing machine can turn itself on. But the other button wont function (like air dry, beeper, water level, wash, rinse, spin, delay, program and start button). Any possible solution to repair it or reset the programs? I have a Maytag top loader that’s about 6 years old. It was working fine until today. I turned the knob to start the washer and nothing is happening.it has power at the outlet.no water is going into my washer at all so I’m thinking it could be the knob? Please help. Thanks advance!!!!!!! I guess the question is are we talking about powering up or actually running of the washer. A lid switch will not prevent the machine from powering up. A bad power cord(rare) – noise filter – main pcb – display pcb will prevent a power up. I have Indesit WIL95 washing machine. problem was not starting the wash cycle. door locks properly (flashing LED goes off & hear the lock sound). but lock LED indicator not coming. it should lit. problem was carbon brushes of the motor. when i replaced brushes. LED lit & start the cycle. I push power button but no lights and nothing starts. Last time I used it, it did not complete the spin, clothing was wet. Still then the problem started… No power, no lights. If your Fisher Paykel Model MW513 has no power and no lights light up, you either have faulty power circuit or possibly the board is loose or wire harness is not plugged into main panel. Check to see if washer gets needed power and if so then check wire harnesses to the board. Kenmore front loading washer Model 796-4137 will not start until we unplug it for about 2 minutes. It will run till load is done. We than have to unplug it again to start a new load. I have a Frigidaire Affinity top load washer. When I push the button on and push it again to start it number 43 comes in the time remaining window and it beeps, I have tried changing the cycle, unplugging it and opening the lid. No matter what it does the same thing and will not come on. I have a front load Kenmore washer model 417.41122310 will not start it is stuck on pause 50 error code. I checked everything, replaced control board panel. I have a Frigidaire affinity front load washer that’s about 4 and a half yrs old. I have tried all troubleshooting. It comes on. The door is locking. It starts. It starts washing…drum turns…then stops minutes into wash. When turn it off and back on it comes on. Door is locking. Lights are on. Can hear it working. Starts wash cycle water loads but drum will not turn…the washer goes through the cycle count down i can hear it clicking but it doesn’t do anything. I have an Electrolux t drive 9kg washer that is having some power issues. Whenever I plug the washer, it goes on for a few 1-2 minutes then shuts off by itself. Can you please help/advise? Many thanks. The LG washer model WT5680HWA I own will not power up. I can do 5 loads of laundry then the next couple of days it is “dead”. The breaker is OK, the power outlet is OK the lid lock works properly. I am stumped. It runs fine when it powers up. I have the same problem. Did you figure out what’s wrong and/or how to fix? I have a front loading LG washing machine (model WM2301HR). I’ve had it for about 3 years. I press the power button and it makes the “powering on” sound. But then nothing on the display lights up, nor do any of the buttons or dial make noise when I press or turn them. If I press the power button again, it makes the “powering off” sound. It’s as of the only button that has any “juice” is the power button. It doesn’t happen every time I try to use washer. And when it happens, I just power it on and off a few times and everything starts working normal again… hence it being an intermittent problem. But the problem is occurring more frequently and I’m afraid it’s only a matter of time before the machine stops working altogether. LG wants to charge me $280 to have someone come fix the problem. Any advice you have would be helpful! (I unplugged it for half an hour and reset it using the pause/play button to see if that is a permanent fix…but since problem is intermittent I’m not sure if problem is fixed). I have unplugged the Washer. I have nothing but clicking noise. When I push power nothing is lighting up. Door is stuck I can not get it open. It just stopped right in the middle of washing a load. I have nothing but clicking noise when I push power nothing is lighting up I did unplug it even overnight. The door is still stuck shut. I have a front loading Kenmore Maytag washer. It powers up, but as soon as I press the start button, it powers off. This is for every cycle except the Clean Washer cycle. It will start on that cycle, but runs for just a couple minutes then powers off. If your Kenmore or Maytag front load washer is powering off when you press the start button, there is most likely a faulty control board or a damaged wiring harness. You will need to take the washer apart and try and identify what is causing the powering off issue. What is the model number of your washing machine? I have a kenmore elite top load washer. I was washing cloths and on my 3rd load washer just stop I thought it was done. I can not get lid up nor when I push power. It just makes clicking noise no lights nothing. My model number is 796, then the other numbers is bigger 31512211. Please help I can not afford to have a repair man come out. Have you tried unplugging the washer for 10 minutes? The door is locked and you cannot open it even with the power off? Is anything on the control panel flashing, beeping, or any errors showing? You may have overloaded the washer and it got “stuck” in a cycle. Try removing power and see if it releases the door. I have Samsung fully automatic washing machine with wobble technology for 4 years. If I start the washer after the water level is complete, I switch off main the switch for soaking clothes and after some time I start machine. It repeats daily, does the machine have a problem? You have a Samsung washing machine, you start it and let the water fill, then you turn it off so your clothes soak longer, but the washer starts after you turn the washer off? Please explain further and give us the model number of your Samsung washer. I have a Whirlpool 1CWTW4740YQ0 that is not working properly, please advised when I turn on the start/stop switch the green fill light comes on and it starts to fill for about 5 seconds then the red door switch light comes on and it stop filling and will not do anything else and I just keep hearing a relay clicked on the control board clicks every minute or so….can you please tell me what part is faulty? Possibly the lid lock switch is the problem. Does the lid lock at all? You will need to test your lid lock switch to be sure if that is the issue. A faulty main control board can cause of the issue on your Whirlpool washer also. When the Red Door Switch Light comes on and it stops filling, this is a communication error and the board MAY need replaced or repaired. Check to be sure all wire harnesses are secure before purchasing any replacement parts. I have a whirlpool cabrio mod Whirlpool WTW6300SW2. Today I unplugged to move the washer and when I plugged it in the interface was flashing in random arrangements but very dim. I also noticed a ticking sound. The noise is coming from the control board. I am weary of plugging in to inspect it without the cover on it. Think it’s a relay. I have a Kenmore elite front load washer. It has had a leak which i just discovered is the dispenser to tub hose which has a hole in it. The problem is before i discovered where the leak was comming from i noticed that the washer would shut off mid cycle. My question is would the leak cause the washer to shut off or do i have another issue to deal with? First replace the dispenser or tub hose that has a hole in it. Once you replace the leaking part, the washer may work. If your Kenmore Elite Front Load washer stops mid cycle after replacing the faulty parts, do you get an error code? What exactly is happening when the washer stops mid cycle, blinking lights? Noises? Beeping? What is the model number of your Kenmore Washer? The display lights on my Samsung washer wf42h50000aw1a2 are so dim I cannot see them. How can I fix his problem? Your Samsung dishwasher may have a main board issue or the display itself is faulty. My Maytag top loading washing machine doesn’t start. Model # MVWX700XW1. Power is on, lights all working, lid lock light is on, lid actually locks. But the machine makes attempts to start, lots of clicking and trying to spin, but it just won’t ever go thru its normal sensing mode. Our washer just quit, and their is no power in the outlet it was plugged into. We flipped the switch but there is no power at all in the outlet. When we plug the washer into an extension cord, it acts as if it is frozen up, and only makes like a ticking noise. Could the washer going out have possibly blown the power outlet. First.. Have a licensed electrician check the washer wall outlet and or the circuit breaker. If you use an extension cord and plug the washer into another outlet and it makes a ticking noise… It may be the timer or another internal part “waiting” to run the cycle. How long have you left it plugged in? We need the model number of your washer to assist further. I have a Samsung WD8704RJD washer. Worked fine. Then tried to start a load of washing. No power to the display board so no led’s working. Any help would be very greatful. Thanks. Have you made sure your Samsung washer is getting power? If there are NO LED lights working on the display panel, something may have flipped the breaker. If machine is getting power, you may have an issue with the main board or possibly a loose wiring harness that connects to the control board. My Beko washing machine is not starting the cycle when i hit start button on the machine. Can you please give us the model number of your Beko washer? Have you checked that it is receiving power? Circuit breaker on wall tripped? My Samsung Diamond Drum top loader won’t start. There is power to the machine, all the other buttons work but when you press the start button nothing happens. It’s about five years old. You most likely have a lid lock or lid switch issue. Can you give us the full model number of your Samsung Diamond Drum Top Load Washer? Same problem…how do we fix it? My Samsung front loader stop washing and i cant open door, doesn’t turn on please help. You can try and open the door on the bottom right on the front of the machine. You will find a small black hose with a plastic plug in the end of it. It pulls out about 6 in and you can use a pan. Sometimes a foreign object may prevent your drum from totally emptying, try something like a Shopvac to either suction it or to blow through it toward the drum to loosen things like missing socks. I’ve got a WSXH208A1WW GE frontloading 8 cycle washing machine. It stopped working, left a lot of water in the tub, and now it won’t go on when I pull the knob, even though there’s an amber light that tells me it’s getting power. Is a fuse blown, and if so, where is it? Where do I start troubleshooting – with the door lock? Yes the door lock may have malfunctioned or is faulty. If you have a meter you can check it or make sure the wire harnesses are tight and secure. Thanks for your article. My Electrolux front loader washing machine turns on, you can select cycles, the door locks, the timer starts counting down as the cycle is apparently running, but there is no ‘action’ in the washing machine. No noise, does not fill with water, does not spin. It does not work on any cycle, whether a washing or spin cycle. Thanks for your advice on which part of my unit is faulty. Please supply us with the model number of your Electrolux front loader. I have a Fisher & Paykel top loader machine. When its switched on nothing comes on but i can hear a humming noise come from the back of it where the plug is. Any help is much appreciated. Possibly a motor, belt, or pulley issue if you hear your Fisher and Paykel washer humming. Unplug it, open the panel and have a look inside. It may be an obvious issue and you will identify the part that is causing the problem with your washer. We have an older Kenmore stackable washer dryer. The dryer works and the washer spin cycle works. I am able to turn the washer knob to move it between cycles and the knob engages. However, when I pull the knob out, there is no sound and the washer won’t fill. Any suggestions? Thanks very much. Sounds as if the timer assembly is bad on your Kenmore stackable washer dryer. Test it to be sure. It may just be a loose or disconnected wire. Troubleshoot to be sure if it needs to be replaced or just have a loose wire reattached. Thanks so much RR ! Much appreciated. Check the LID SWITCH to be sure it is in the correct position and it is working electrically. I have a Amana top load washing machine.. Someone took the lock off the lid lock now it’s is broken. Will not power on. What do I do. Is there a way to bypass the lid lock? Yes there is a way to bypass the lid switch but it would be a safety issue. Order a new one online for about 20 dollars. We can tell you the exact part to order if you give us your full Amana washing machine model number. Yes all washers should work with NO CLOTHES in it. Why would you ask this question? Having issues with your front loader? What does d5 mean on a Samsung front load washer? The D5 error is actually DS. The code means the washer thinks the door is open or unlocked during the cycle. The door has to be checked. Is it properly closed? My Samsung washing machine stops displaying at no.8 and continues spinning nonstop. All the control panel switches stop working, so I switch off from the main socket, make SAMSUNG WA10R3. Your Samsung Washer stops displaying at number 8 and THEN begins to spin non-stop? So after the number 8 on the display goes out, the washer just keeps spinning and the display becomes non-responsive? Helpful, keep sending helpful hints on appliances to me thanks!